Yahoo!7 is about to release version 1.0 of Yahoo! Alpha beta - a new service that allows users to create personalized search engine homepage using an intuitive drag-n-drop interface. Unlike Google Custom Search engine which is closely tied to Google Web Search, Yahoo! 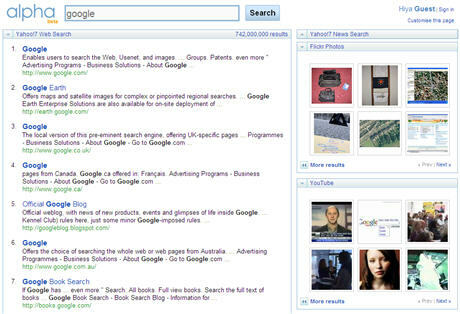 Alpha shows search results from various Yahoo! or third-party services on the same page. The services currently available are Yahoo! Web search, Wikipedia, Flickr, YouTube but you can build your own search modules as long as they provide search results are available in the form of RSS feeds. There's also a special module called "Sponsored Results" that displays text ads based on your search query. This gives a strong hint that Yahoo! may be planning to share ad revenue with users just like Google's CSE. Yahoo! Alpha is still in beta but looks very promising. You can think of Yahoo! Alpha as a start-page like Netvibes or PageFlakes where every widget is related to search.